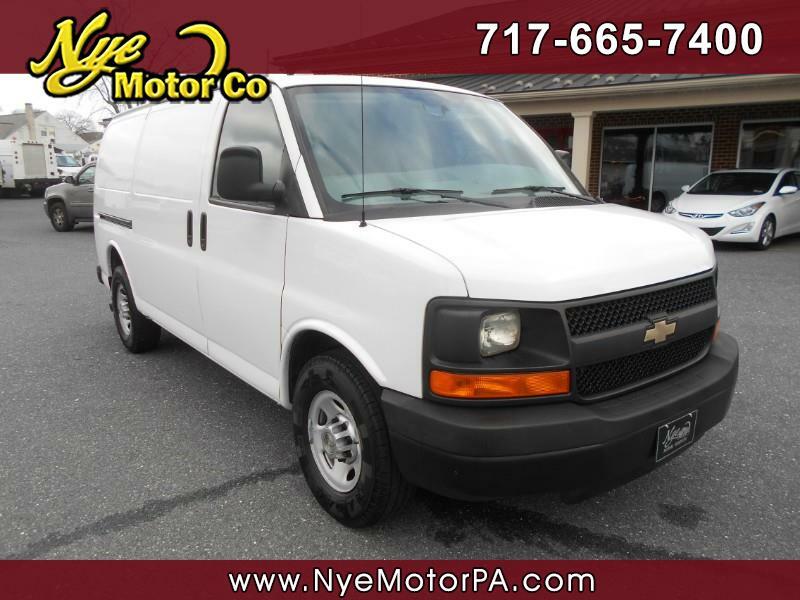 Used 2013 Chevrolet Express 2500 Cargo for Sale in Manheim PA 17545 Nye Motor Co.
****1-OWNER****READY TO WORK****LOW MILEAGE****BACK UP CAM****REAR SHELVING****MUST SEE**** Get to work today in this awesome 2013 Chevrolet Express G2500 Cargo Van with only 49K miles! Outfitted nicely with Back UP Cam, Rear Shelving, Gamber Johnson Console Box, Rubber Floor, Cd, Aux Audio Jack, Am/Fm, A/C, Heat, Automatic Headlights, Power Windows, Power Door Locks, Power Mirrors, and More! Call today to schedule your test drive. All information and options listed are deemed reliable, but not guaranteed. No Hidden fees! Nye Motor Company Guarantees Full Disclosure! At time of purchase Buyer pays State Tax, State Registration fee, State Title Fee and Dealer Documentation fee ($98.50). State Lien fee and State Tag fee may apply. (All other taxes and fees will be paid in state of residence.) Information listed is not guaranteed, and must be confirmed by the purchaser before purchase. Visit Nye Motor Co. online at www.nyemotorpa.com to see more pictures of this vehicle or call us at 717-665-7400 today to schedule your test drive. From the moment you step on our lot until the time you drive away in your next car, your buying experience with Nye Motor Co. is our number one priority. We encourage you to use the expertise and resources of our sales staff; they are here to help you find the right car at the right price. Call us today at 717-665-7400 to schedule your test drive!